We’d love your help. Let us know what’s wrong with this preview of River of Time by Naomi Judd. To ask other readers questions about River of Time, please sign up. While it’s always useful to have narratives to help people understand depression and anxiety, this one is quite flawed. Ms Judd talks about her treatment resistant depression, but she does not follow through with treatments that are showing results. Her remarkable recovery with DBT leads to the question that she never asks: is she also diagnosed with Borderline Personality Disorder? BPD would explain quite a bit including why she does not experience much relief from medications. Less important i While it’s always useful to have narratives to help people understand depression and anxiety, this one is quite flawed. Ms Judd talks about her treatment resistant depression, but she does not follow through with treatments that are showing results. Her remarkable recovery with DBT leads to the question that she never asks: is she also diagnosed with Borderline Personality Disorder? BPD would explain quite a bit including why she does not experience much relief from medications. As someone who has suffered from severe depression at points in my life. This book was very healing in some ways. When you are a celebrity talking about mental illness isn't pretty. Being an advocate for mental health is not an easy task. Every now and then people like Carrie Fisher and Naomi Judd come out of the woodwork and teach us that even when your life looks amazing, you might be struggling and fighting about no one can see. This book is truly not for the weak or faint of heart. Judd brin As someone who has suffered from severe depression at points in my life. This book was very healing in some ways. This book is truly not for the weak or faint of heart. Judd brings us along for the horrific journey that is crippling anxiety, and serve depression. She lays it out honestly and packs a punch. She is realistic and at times creates some unflattering realities of the medical staff in the United States. Mental health has a stigma attached to it. Which seems doctors are even susceptible to. These "invisible" illnesses are often not given merit. After Naomi had gone on a tour with Wynonna, she fell into a spiral of depression, panic attacks, and debilitating depression. It came from nowhere. She had just completed a successful tour in 2010-2011. She was a Grammy-winning superstar. At that moment though she believed she had every reason for ending her life. That is what depression does. You can be on top of the world but when the switch flips nothing seems worth it. Naomi would spend the next two years in psychiatric hospitals, trying meds, undergoing therapy and treatments. In River Of Time, Naomi is very honest and courageous. She crushes the stigma and puts a call out for better treatment of depression. This is a great read for anyone who is struggling or enjoys celebrity books. Disclaimer-I received this book for free in exchange for my honest and unbiased review. Thank you, Hachette, for sending me this book. I had a lot of trouble with authenticity with this book. It started with a line that Naomi says something to the effect of "I was born Naomi Ellen Judd" when in fact she was born Diana. When something as simple as that is a lie, how much of the book can I believe? What’s it About? To many, Naomi Judd is a superstar, one half of the country duo The Judds but River of Time isn’t about her life as a celebrity. It is more of a documentary about her life with treatment resistant depression and anxiety and Ms. Judd doesn’t hold back at all. River of Time painted a raw, honest picture of one woman’s struggle with depression and anxiety that I found completely relatable. I too suffer from depression, I was diagnosed with it at 14 and now at 32 am still struggling to cope, and find a treatment that works for me. I didn’t pick up this book because I was searching for an answer to my depression but rather to remember that I am not alone in dealing with depression. Naomi Judd knows what it feels like, she can describe the symptoms in vivid detail, and she was candid about how certain treatments affected her and in fact made things worse for her. Ms. Judd didn’t shy away from discussing her early traumas and abuse and how they shaped her as a person throughout her life. What I found interesting was that Naomi has kept herself well informed about depression over the years. Not just from her personal experience but by reading the latest medical facts, yes I know she was an RN before her musical career took off but her dedication to learning as much as she can about depression is nothing short of admirable. The irony here is that while Ms. Judd is part of the medical community, that same community is painted in an unflattering light due to the way it handles the treatment of mental illnesses. I felt like Ms. Judd truly wants to understand as much as she can about a mental illness that effects many people and carries a stigma that often keeps people from seeking help. Ms. Judd encourages people to seek help but also to not limit themselves to only “traditional” treatments. Sometimes it takes more than one treatment, sometimes a person has to keep trying different ones before they find one that works and that’s okay. Everyone’s depression is NOT the same as evidenced by her own treatment resistant depression. 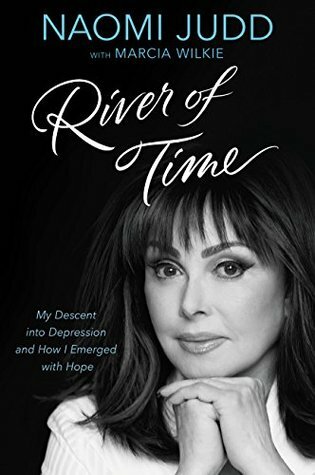 By the end of River of Time I felt like I had a champion in Naomi Judd, it sounds silly but depression can be very isolating and to know of someone who understands how you feel because they feel it too is a relief. It’s not a perfect book by far, there is an element of drama to it that I didn’t care for, but for the most part it was an eye opener. This book should be required reading for Representatives of Congress and Senators who don't think we need more funding for mental health. With candor and pain, this memoir describes Ms. Judd's descent into the darkness and ascent back out. Given her family history, it is remarkable what she achieved in her life. However, unlike most people, Naomi has the t The social stigma of panic disorder may be even worse than the social stigma of depression, and Naomi Judd was brave to tell about her experience with both in this book. Her upbringing and background would make a great country song, except it would be too sad to be believable. So many people admire her, and I'm glad that she has been open about her struggles both past and present. No one, not even a celebrity, has a life free of hardship and struggle. Don't dismiss Naomi just because she's in show business. She's also been a registered nurse for over 35 years. Moreover, she spares no physical or emotional detail of her ordeal: why would anyone make this stuff up? Naomi offers possibilities based on her own "climb out of hell on a steel ladder" (her words). Lots of useful source material here as well. A journey, though not for the faint of heart, through the hell that is anxiety and depression. Judd lays it out realistically and offers an unflattering picture of the medical community in the United States that doesn't really understand nor seem to care for those suffering from these diseases. Quick read about Naomi's struggle with crippling anxiety and depression, which was deemed Treatment Resistant. Ms Judd is very honest and courageous about her journey and puts a public face on mental illness, which she hopes will help others. Naomi Judd writes a very personal honest book about dealing with severe depression. For a few years she was struck very hard with depression. She writes about how it runs in her family and some family member who have committed suicide. She writes she was very close to doing the same thing on a bridge but stopped herself. She went through very intense times in hospitals trying to get off the strong medications she had become addicted to . I give her a lot of credit for being so honest about what Naomi Judd writes a very personal honest book about dealing with severe depression. For a few years she was struck very hard with depression. She writes about how it runs in her family and some family member who have committed suicide. She writes she was very close to doing the same thing on a bridge but stopped herself. She went through very intense times in hospitals trying to get off the strong medications she had become addicted to . I give her a lot of credit for being so honest about what she went through. I have experienced mild depression, but nothing like what Naomi describes here. However, her book made me feel like you can overcome any adversity,no matter how severe. It reads as though you were having coffee and conversation with a friend. I loved her insight and thorough descriptions of everything she went through and also how the treatments either helped her or didn't. She was also very honest about her family, which can help many people who have difficulty of their own wi Wonderful insight! I listened to this book as an audio book. From the beginning to end this book held my attention. Naomi's story is shared from the inside out. I listened to this book because of my connection with people who struggle with depression and other mental illnesses. Naomi lives a public life with many people watching her every move. Behind the scenes she struggled for years with severe depression. Eventually in this book she gave everyone a look into her behind the scenes life. If we are willing this boo I listened to this book as an audio book. From the beginning to end this book held my attention. Naomi's story is shared from the inside out. I listened to this book because of my connection with people who struggle with depression and other mental illnesses. If we are willing this book will assist us to stop placing standards on people who stand before thousands on a pedestal. This will also assist us to understand people who live everyday lives who struggle with depression. Gave me some ideas to suggest to depressed members of my family, so that is good. But as in everything about her personality, yesh; d.r.a.m.a. queen. Deep into the book the doc asked her questions that were "like a cold bucket of water" Really? Really? Those questions never occurred to you before, really? Sorry her brain chemicals are screwed and she can't help that, but mmmmm... Need some hard, tall boundaries. I found this book helpful in understanding depression, anxiety, and trauma from the viewpoint of someone who seems to "have it all". In addition to being completely honest about her challenges (including suicidal ideation), Naomi Judd provided some solid strategies to living with mental illness, which I appreciated. I really enjoyed this book. To think that someone of Naomi Judd's talent and fame could fall into such deep depression and have severe anxiety/pains attacks makes you understand why some people commit suicide. I was happy to rad hat he has found a way to overcome her condition and deal with it in a healthy way. This book shows that money and fame can't buy good health, happiness or fulfillment. Thank you for sharing your journey Naomi. I got information that I haven't been able to find from anywhere I searched. I'm nut sure what I thought of this book. I wanted more of a biography of Judd's life, but this book covers a very brief period in extensive detail, with flashbacks to younger days. The variety of treatment options discussed is truly dizzying, and leaves me grieving for all the author went through. Very interesting memoir of her terrible depression. Kudos to her that she came out, so other people can understand and empathize with this terrible problem. Hopefully she has turned the corner forever. Second try, second DNF. For me personally I can't finish this. I love Naomi and the courage it took to write this book. I loved her previous books and I don't know what it is about this one, but I can't finish it. I hope it helps someone though. I enjoyed every minute of this book. It was great to hear about Naomi's struggle with depression and anxiety - I can't imagine what it would be like in a celebrity's shoes, but she describes her experience in a lot of detail. It gave me hope to keep pushing through my depression.